The Senators made one trade before the NHL deadline on Thursday, adding Tyler Arnason from the Chicago Blackhawks for prospect Brandon Bochenski, and a 2006 second-round draft pick. Goaltender Mike Morrison was also claimed off waivers from Edmonton. The Ottawa Senators made two additions before the 3 p.m. trade deadline on March 9. 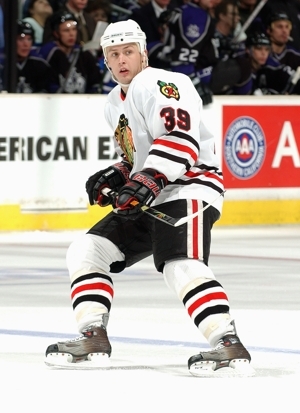 Centre Tyler Arnason was acquired from the Chicago Blackhawks in exchange for prospect Brandon Bochenski and a second-round draft pick in the 2006 NHL Entry Draft. In another move, the Senators also added goaltending depth when Mike Morrison was claimed off waivers from Edmonton. Arnason, a native of Oklahama City, Okla., who will turn 27 on March 16, has been one of Chicago's top players offensively this season. Despite playing on one of the NHL's lower-ranked teams, the five-year veteran has scored 13 goals and 41 points in 60 games. Senators coach Bryan Murray spoke about the addition of Arnason. "He's a skilled player. He can make plays. He's been a plus player in Chicago on a team that hasn't had a lot of wins in comparison to other teams in the league. He's probably a player that was looking for a chance and an opportunity on a good team, and I think that in itself should really help our team, because I believe he will come in highly motivated." Morrison, a Medford, Mass., native, registered a 10-4-2 record and 2.83 goals-against average in 21 games with Edmonton. The 26-year-old is scheduled to be available for the Senators game in Atlanta against the Thrashers on Friday. Morrison last represented the Oilers on March 7 when he replaced starter Ty Conklin in goal for the shootout of a 4-3 loss to the Dallas Stars. Murray was glad to see another NHL-calibre goaltender added to the roster. "It gives us a real depth guy that can step in and play, and play pretty well. At this moment, it serves a real purpose for us. Big people that are square to the puck and have ability to go in and play games, and win games for you at this level, are hard to come by."